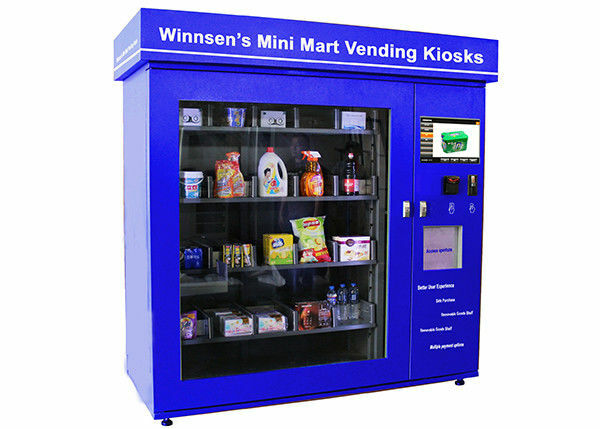 As Self-Service Solution leader, Winnsen’s Mini Mart Vending Kiosks is a highly secured and more flexible retail vending machine. We provide vending Kiosks and machines hardware, software, as well as management system, which helps you reduce operation cost and increase sales revenue. This advanced US Euro Coin/Banknote/IC card/Chip Card Operated Snack and Beverage Combo Vending Machine Station, we call it Mini Mart Vending Kiosk Machine. It is equipped with coin acceptor, bill acceptor, card reader, industrial computer system, 19 inch touch screen, intelligent elevator, electronic door, as well as adjustable channel system. • If the parts you need are not listed above, please ask us. 7. Software Options: Report function, remote control system, stock management background and etc. 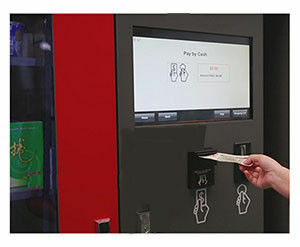 This US Euro Coin/Banknote/IC card/Chip Card Operated Snack and Beverage Combo Vending Machine Station could sell different type goods, and you could adjust the channel width to accomodate different size packages, which makes it can be used in nearly all public locations.